My breed history dates back some 2000 years, but today there aren't many of us around. 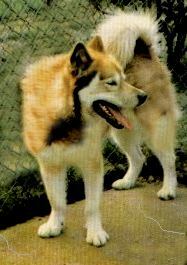 My relatives served as sled dogs for the Inuit Eskimos and were noted for their endurance and strength. Efforts are now underway to save my breed from extinction. I have a thick, dense coat and come in various colors, including all white. When fully grown, I am between 24 and 27 inches tall (61 to 68.6 centimeters) and I weigh between 75 and 88 pounds (33.8 to 39.6 kilograms). We have no Canadian Eskimo Dog Breeders listed at this time. Click here to place your Canadian Eskimo Dog Ad!